Both a symbol of a journey’s end and a classic sign of strength and stability, our petite diamond-set anchor charm necklace is a perfect reminder of the strength found in friendship and love. A lovely talisman to wear, or gift a friend, as you move through the sometimes rough waters of everyday life. We think this charming layering necklace makes a lovely piece that’s easy to pair with your statement necklaces and adds just enough sparkle for that daily coffee run. A wonderful gift for someone in your life who needs a little reminder that there is someone in their corner. 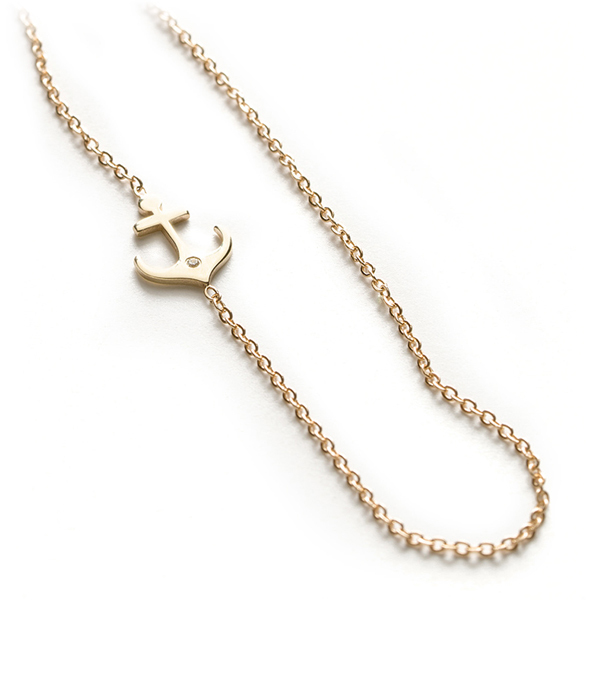 This charming 14K gold layering necklace features a 16 inch chain, and is hand made by our artisan jewelers in Los Angeles. Categories: Charming, Maria's Favorites, Necklaces, Under 500.